I have been living here for 14 years now and have seen many changes in what is on offer food wise in Berlin. When I arrived I really had to drive around to find an Asian store selling basically what I took for granted living in Canada and the UK. The supermarkets sold a brand of Chinese cuisine products that was pretty naff and definitely no fresh veg, in fact I don’t even think ginger was available then let alone baby corn or lemon grass! Thankfully things have changed. The supermarkets are now offering a bit more and basically every busy shopping street has an Asian shop. There are even now several warehouse style shops selling Indian products as well but they are pretty rough and you have to be a die-hard Indian food fan to shop in these places. The other difference of course is British food products. Berlin did have at one point a huge supermarket that was a chain from Holland selling anything expat. It was great, but sadly closed down after a year or so. We had a Cornish Pasty shop too for a while but I think it’s location killed it off! There are a few British stores selling tinned and packaged goods but there is nothing fresh to buy. Frozen sausages and bacon and some pies, but nothing fresh, that is until now. A few weeks ago I did a sausage tasting for a British food shop from whom I buy my jars and dilutables, they even sell crumpets, sliced white and bacon now too, but nothing that can be refrozen. However, in the last week I have now discovered an outlet for pork pies and a guy that has started to make British style sausages, dry cured bacon and black pudding! And all in Berlin! The sausages and bacon are not such a big deal as I buy once a year from the UK and freeze them ,and any visitors I have bring them over. But I do love a pork pie. Other pies I make myself and in fact sausage rolls I make fairly often for my sons school events or parties. So I was pleased to find out that pork pies are now available in Berlin and once a month they are showcased in a Piefest of sorts and they can be orderd online. Anyway, I found out a date for this fest and made my way with top food critic, Henry Wakelen ready to try a pie! 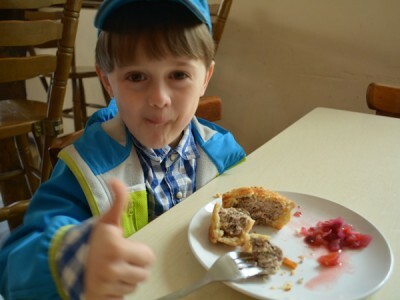 My son Henry actually is a big fan of sausage rolls and scotch eggs and never really liked pork pies because of the jelly in them. After all, shouldn’t jelly be sweet? The fest was held in a pub typical of the area, none of the table or chairs matched up and the usual crowd of people with their Birkenstocks and hand knitted sweaters, then I spotted who I assume to be Laura from Pieoneers, by the door with her table set out with a selection of pies. I swapped a jar of my home-made pickles for a pork pie, she even gave me a spoonful of her homemade tomato and onion chutney too and also I bought one of the sweet potato pies. Henry and I sat down and sampled the wares. I got a thumbs up from Henry. He liked the meat inside the pork pie. It was firm and seasoned nicely and the pastry was nice and crisp. Pork pies can be a bit dry so the chutney was a good thing although in my opinion I thought it could have been a bit thicker, nice flavour though and I’m sure it would thicken up in the jar (my plan is also to make my own pickles and chutnies). The other pie the spiced sweet potato was baked more like a pasty and in flaky pastry. This was good too, although Henry didn’t like it. He loves the pastry but he advised me that he is not a big fan of sweet potato. So there you have it. All in all it was a good experience. 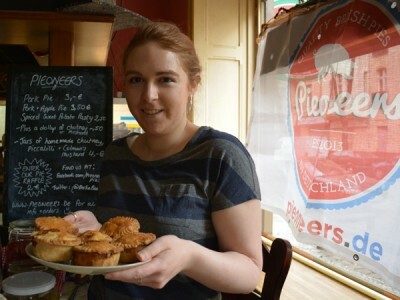 We met Laura from Pieoneers and we will of course go again for more pork pies and will watch Pieoneers closely to see what else they will be offering. Myself, well, I will certainly have a go at making some. It’s easy to get recipes these days and I am pretty confident of taking on anything. I do make my own mince pies for Christmas and the pastry making has improved!